Nati spotted Krackpolish in my “Waiting to be tried out” box. It’s one of her huge lemmings so I layered it over 4 different base polishes just for her. From left to right: Essence Gothic Girl, China Glaze Adore, China Glaze 2030, Golden Rose 242 and lying down Krackpolish Hunter Green. I applied base polishes in the same orders as above and then layered them with Krackpolish. even if K. is dry it can still smudge if we used very smooth polish for base (think China Glaze Khrome collection). Removing this polish was also a battle – I had to use acetone to get rid of the green color. 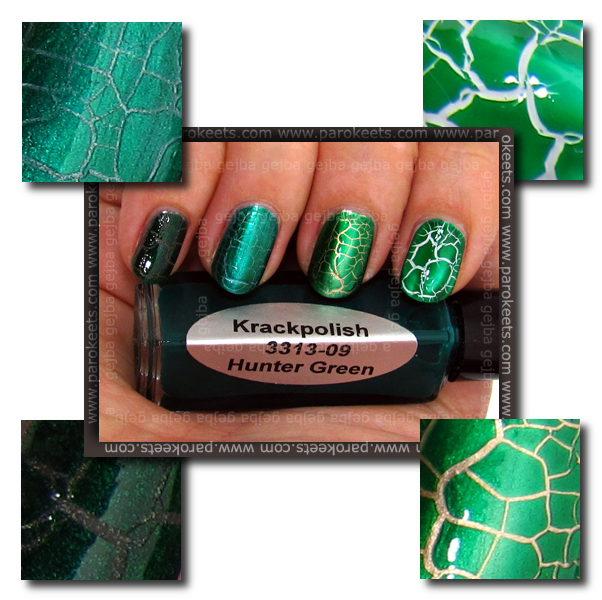 I ordered Krackpolish on TransDesign. wow- I’d love to have one of those- where’d you get it? I love the effect! Great post, Gejba! Thank you for showing this. I have been wanting to try this but I was a little wary. It looks amazing! As interesting and fun as I think this polish is for some reason cracked polish kind of freaks me out. Must be one of my many OCD issues! I think the effect is really interesting!! I like it the most with the biggest contrast in colors but you’re right – if it’s a pain then konad is a good alternative. I’ll probably get one though :whistle: . hočeeeeeem hočem hoččččem :w00t: :stars: :w00t: gejba, ful sem si želela tole videt, ampak nisem pričakovala niti približno tako norega učinka! Krasen je! Ampak zveni grozno problematicno? Najlepse pa pride cez zlato, prav unikatno :). Zelen mi je bil v TD ponudbi še najbolj všeč. Ostali so delovali nekam dolgočasno.